GAS – Gear Acquisition Syndrome – afflicts many musicians, but guitar players seem particularly stricken by its evil, wallet-sapping nature. If you’re reading this, we’ll bet you know how it is. Substitute your irrational gear weakness of choice here – you could be an amp addict, a pedal junkie or a Les Paul lover, for all we know – and this is what we’re talking about. Why does it happen? We’ve no idea. You might have heard a great song, seen a cool new band, or just had an earworm going round and round in your head all day. And somewhere in your subconscious, your inner guitarist is telling you that you absolutely must have that piece of kit to replicate those sounds. Or something. To come back to the question we posed up top, though, why is it that most of us don’t put more than a second thought to our choice of speakers? They’re just not something we experience GAS over, apparently. 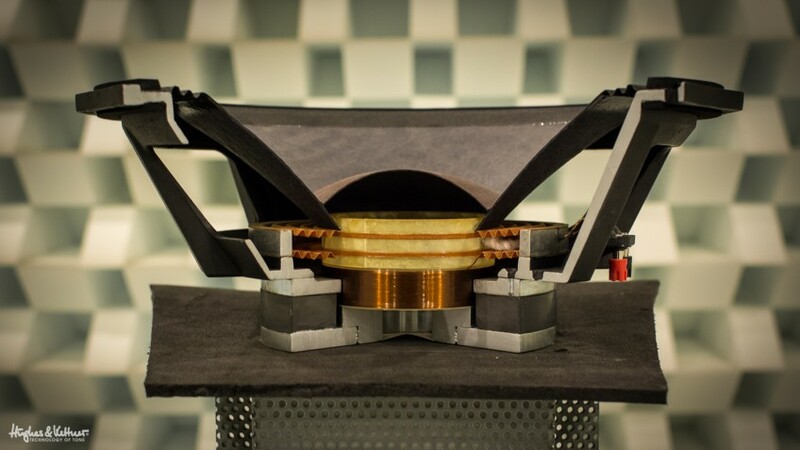 The inner workings of a speaker under testing at H&K headquarters. Some wise person (no, it wasn’t us!) once mused that the soul of our guitar tone is somewhere in that paper cone, and we’re inclined to believe them. We all know that our choice of guitar, pickups and amps are hugely important in defining our tone. That’s a given. But speakers are what actually make the sound that we hear when we play plugged in! So they’re rather crucial too, even if lots of us just accept the models that come with our amp of choice as a given. These days, speakers come in a huge variety of different brands, shapes, sizes and combinations. The most iconic setup is the classic 4×12 cab, which features – you guessed it – four 12” speakers and is generally accepted as something of an industry standard, especially when it comes to classic rock sounds. But there’s far more options out there if you want to change things up a bit. Let’s start with combos, which feature the amp and the speaker cabinet in one practical combined box. By definition more limited than head and cab combinations in terms of mixing and matching, they’re nevertheless available in a bunch of different flavors. If you’re looking for more low-end, you should consider a larger speaker size. With combos, this means a 12” speaker, a 2×12 or even a 15” (these are rarer), rather than a 10” or 8” option (which are typically found in amps intended for home or practice use). With combos, you also need to consider the open back/closed back question. This can make a difference in tone, of course: if you’ve got two otherwise identical setups, an open back cab will give you a more open, complex and looser sound that will spread around your venue more, while a closed back cab will be the opposite: tighter, punchier and narrower in terms of the geographic area it’ll cover. Moving back to heads and cabs, and the size issue also applies: generally, the bigger the cab/speakers, the correspondingly larger the sound will be. So, what to look for if you want to change your sound by changing your speaker(s)? Well, it’ll help if you know the sound you’re after. There are a huge number of speaker makes and models available, so seeking the help of a speaker expert – or making a choice based on a player whose tone you greatly admire – is a good way to go. You’ve got to make sure your new choice will work with your existing amp, too. “A guitar amp’s tube power amp works on the principle of matching impedance. In practice, this means using corresponding speakers and amps. For example, if you connect an 8 ohm speaker to the 8 ohm output on a tube amp, the internal resistance of the source (that is, the tube output stage) is exactly that of the load, or speaker. If you’re not sure of your amp’s impedance, check the back panel, and if it’s not written there, ask the company who made it to help you out. Oh yes, and if you’re playing a closed back combo, pay attention: it might be more difficult for you to find a speaker that fits properly, and it might be pretty difficult to get into the cabinet in the first place. But of course you can always go see a pro tech if you’re not sure about something. 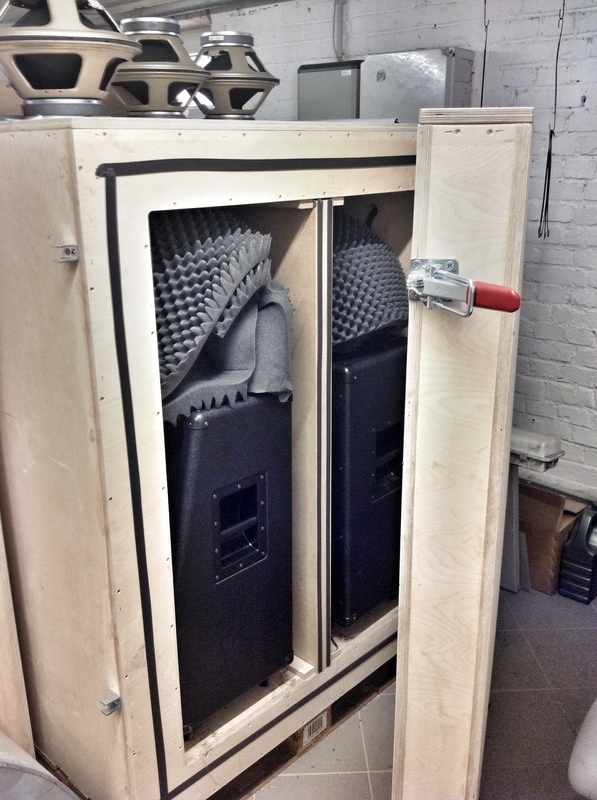 A speaker/cab testing unit at H&K HQ. Basically, we turn everything up to 11 and leave the cabs blaring over the weekend. The surrounding wooden box is filled with sand and locked in a fireproof room, so our neighbors can still sleep at night! And why change your speakers when you could just buy a new guitar instead? That’s a good question, and of course there’s no straight answer. If you want that new six-string, you’re going to buy it, and more power to you! But decent speakers can certainly be had for cheaper than a new axe or a new amp, they’re relatively simple to install (especially if you let a tech do the work) and they’ll make a significant and immediate difference to your sound. Fresh speakers can breathe a new lease of life into an ailing amp, add an extra twinkle on your tone, and make the difference between a good and a great guitar sound. But of course there’s those other elements to think about too: the wood in your cabinet, your guitar, amp head, pickups, plectrum, strings, your technique… And so it goes on. Only one thing in the tone game’s for sure: if you love your sound, you’re well on the way to experiencing your own musical enlightenment. So why not try a few new things out? Get down to a store and try out a few different speaker types. Borrow a friend’s cab for your next gig. Check out some A/B comparison videos on YouTube. Hell, even play around with speaker types in an amp modeling app – it all helps, and if you’re having fun, you’re on to a winner. First published: February 27 2015. Most recent update: February 27 2015. Hi, here I am and three years later…. I’d only prefer Celestion’s because of the ‘heritage’ thing. As we all know tone is based on lots of factors (including speakers). Like the sounds I get from Eminence Rockdriver. How easy / difficult is it to swap the speakers anyway? Not something I’d attempt….Still playing my Switchblade!! You left us hanging for so long 😉 Actually, no problem at all, and thanks for letting us know! Speakers are not that difficult to swap out – if you know what you’re doing. We’d always recommend a tech do stuff like that, just for peace of mind. We know people who have ended up accidentally cutting their speaker cone while trying it, which is obviously not ideal! What is the ohms of each speaker in the 2×12 Hugh’s & Kettner cabinet. I need to replace one. I have a 60 watt fender supersonic combo I use to play out here and there. I don’t like the sound of the vintage 30 that it came with. It’s sounds to britle. It could be that the amp is bright too! I have a speaker made by fender that was in a solid state fender roc pro 1000 combo, and I put it in the supersonic and it sounds much better. Both speakers are 8 ohms so the impedance is correct. I am not sure what watts the fender speaker is that I replaced the vintage 30 with, but It says in the manual of the roc pro that the volume of this fender speaker is 69 watts @ 8ohms @5% thd. & 94 watts @ 4 ohms @5% thd. The supersonic is 60 watts so would it be ok? With those specs now many watts might the speaker be? I have put the Austin Speaker Works “CROSSROADS” greenback inspired, super-creamy lush sounding creations in all my cabs from my orange th30c and my Hughes and Kettener 212 cab I use with my GM36 to Marshall Stacks of 4×12’s used live. You will never use anything else once you hear that sweet honest vintage tone. Your gonna sound like jimmy page with these speaks if your good. You gonna sound like drunk jimmy page if your not so good, but your gonna sound like jimmy page. I also play and old LP through a Reeves. That helps. Around two years ago, Chirstmas period, I found a second hand Mesa Boogie Rockett 44 for sale and based on its fame I went for it. In the shop it sounded good, so I thought that was the solution for my problem, a good/loud and valve amp for me to take to my gigs, right? Wrong! At loud volumes the amp sounded very boxy and harsh on the top end (uncontrollable highs)… I tried it in many different places and situation and never felt satisfied with the sound I was getting out of it! After a long lasting search (articles, forums, youtube, etc…) I decided that a modification would solve my problem. I did the MOD, changed the tone stack of it based on what someone’s youtube sugestion… Problem solved? Almost as the amp improved some of those frequencies that used to bothered me deeply. While researching a out amp mod and etc, I also considered a speaker but I thought that it wouldn’t make such difference. Wrong! Replacing the speaker made the amp sound as good as the sounds I have always dreamed about having. For the sound I wanted I completely rely on an alnico type speaker and that’s what I have now, the Celestion alnico cream. 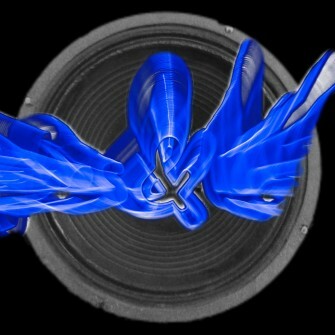 If you ask me now, what you change first on an amp I wil say, the speaker! Hi 🙂 So i use the same amp as you for over 2 years now and it has his original speaker. I was wondering have you tried a few different speakers? I am leaning towards louder sound, or as clean as i can get, without breaking up the amp. Any suggestions? So I recently ordered a Tubemeister 36. I would have also gotten the tm212 but seen they came with 2 v30. I’m not too fond of those speakers so I wanted to get another 2×12 cab with different speakers. Perhaps another kind of Celestion. I’m new to the cab scene as I’m coming from a combo amp. That being said, I’m not too sure which type of speakers will work with the 36 head. Am I restricted to finding two other 60w speakers like the v30 is? I just don’t want to damage the amp or speakers. Well I currently own a Coreblade that I got on Ebay for $1225, which I use with a Port city os wave cabinet, that is loaded with a Jenson black bird, and a tornado. The Jenson speakers are pretty expensive, and I decided on them cause I heard a video on youtube, and the guy was using a switchblade 2×12, and thought what the hell. The sound I get is pretty bright dgenti sound which I have a tendency of leaning towards, but some times it winds up being to harsh due to extra distortion that I have a tendency of adding in. The weird thing is when I use headphones my sound is way less distorted, and smoother, which I do like. I plan on getting my 2notes torpedo live hooked back up so I can go through speaker sims via there store so I can test the water, to see if there might be a better option for my amp. 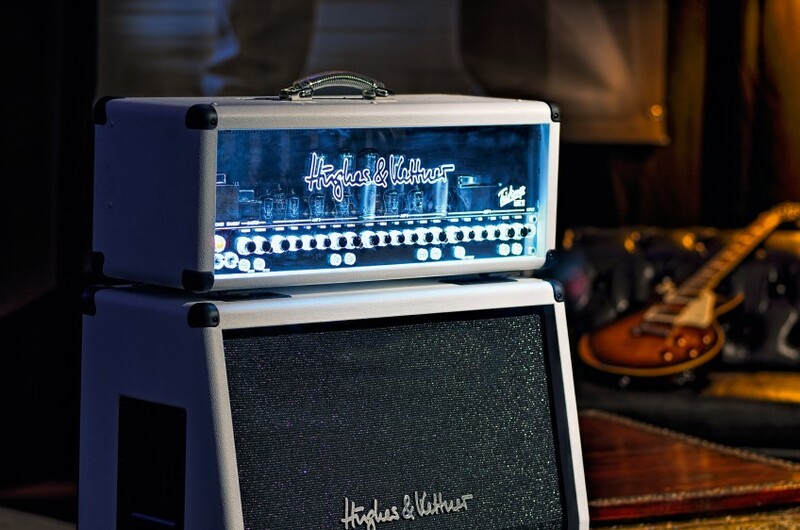 I’ve been thinking from time to time that maybe I should buy the original speaker for the Coreblade cab to see what Hughes and Kettner envisioned for that amp. I was playing my sound yesterday moving the mic a round, and decided to go back and try a Shure SM57, which did sound pretty good with the new position, and different settings I used on my amp, so mic can also make a big difference for recording purposes as well. It’s helping me a lot to understand how to get a good sound out of my gear, and I’m experimenting now with different cabs / speakers. But, when you started your explanation, you’re referring to a “tube amp”. Is there any difference using a tube amp versus a solid state amp when choosing the speaker? “Generally, you can safely run a 60-watt Celestion speaker at 60 watts and it’ll keep going all day long. Connect it up to 100 watts and it might work for an hour or more before it incinerates. “Over-power” any speaker and it’ll work fine for a while; just don’t bank on it lasting” ( the entire post here: http://celestion.com/speakerworld/guitartech/1/37/Speaker_Upgrade:_Power_Handling/ ). Then, I noticed that all Marshall and Fender combos are equipped with speakers having twice the power than the amp’s power. Probably this is more like “on the safe zone” approach. I think, if you know how to use the amp’s volume knob and your common sense as a guitar player you’ll have a perfect sound. You have great questions for us, and they touch upon the essence of what guitar amps and guitar speakers are about. As manufacturers we all have knowledge which we like to keep to ourselves, for obvious reasons! However, to answer your questions, what I can do instead is give you general guidance on ‘the nature of guitar loudspeakers, amplifiers, and guitars’, and their role in finding the tone that you are looking for. 1) The signal that you deliver to your amp from your guitar. And this is affected by the quality of the guitar itself: is it single or humbucking pickups, have you old or new strings on it, are they standard gauge or ‘heavy’ gauge, how stiff is the plectrum (guitar pick), what position are the guitar controls set at, and so on………..? 2) The guitar amplifier itself. A) Is it a digital amp (where you do not produce sound, you just reproduce it by triggering digital information)? B) Is it a transistor amplifier (which aims to copy the sound and behaviour of a tube amplifier but with solid state parts)? C) is it a Hybrid amp, which is a preamp tube section with solid state power amplifier? D) Is it a tube amp, where both pre amp and power amp section contain vacuum tubes? A) What size/diameter is the speaker (12″ is the traditional ‘best’ size? B) What is its power rating? C) What Ohms rating does the speaker have? D) What type of housing is it in? Combo format? 4×12 cabinet format? 1×12 format? 2×12 format? E) Is the speaker a ‘vintage’ build method, or is it a ‘modern’ build method? If you always understand that, within a traditional guitar amplification setup, this triangular connection between the guitar, the amp and the speaker and the list of questions above, is crucial to understanding why amps sound as they do, and who does what with their products. Of course, when you pay more, you generally get more. But…I never found a really well documented article on the internet about matching amp’s output power with the speaker. – some websites are claiming that you should have a speaker that can handle at least 1.5 more power than the amp is delivering. Which theory is correct in your opinion? “Rule of thumb would be that a tube amp of any wattage will work well with a good guitar loudspeaker as long as the loudspeaker(s)’ power either equals or exceeds the power of the amp itself. For example, you can play the V30 at 1 Watt if you wish, or at 60 Watts. If you overpower a speaker in a tube amp, for example a 100 Watt all-tube head playing through a 1×12 cabinet with a Celestion 25 Watt G12M, you will not only heat up the voice coil too much, you will also mechanically wreck the speaker through overpowering it, so it will fail. You do not need masses of power to bring a guitar speaker into distortion mode; The right speaker will distort at very low volume if designed to do so – for example, Jimi Hendrix in one of his Marshall cabs apparently had 4 x Fane guitar speakers, which distorted beautifully at low volume (Wind Cries Mary), and distorted dreadfully at high volume. He only used them at low volume, therefore. From what I learnt about guitar speakers, the power amp needs to be similar or less power than the speaker itself, but there should be some reasonable equilibrium between them. Well yesterday we had the A/B comparison session between his V30 loaded closed back cab and my Greenback loaded closed back cab. The difference was astounding. I definitely prefer my Greenbacks over the V30s. The V30s were considerably darker and I felt muddy in the mid range. They were certainly tighter in the lower end, but the Greenbacks just had a sparkle and bite to them that I loved. Without dialing in any eq at all, just purely swapping between the boxes, the Greenbacks had a great clarity to them. Would absolutely recommend that any guitarist do this, the difference speakers makes to tone is significant. Very interesting, and we’re not surprised that you heard such big difference between the two speaker/cab types. Did you try a range of different genres/sounds/guitars too? I use an edition blue 60 with an eminence Swamp Thang and I love what its done to the sound! Although I had to put some dampening material in the cab as it struggled with all the extra bass output, so that maybe one thing to be aware of when changing speakers… This 150w speaker and is really efficient so it has loads of clean headroom and has given it a really clear, modern sound. I gig it over amps 4x the price now as its more reliable than my tube amps but sounds just as good :). Definitely recommend experimenting with different speakers you’ll be amazed at how much it changes things. Wow, that’s a cool story – not often we hear of a player putting a more’boutique’ speaker into an entry-range amp. We’d love to hear how yours sounds! Solid state amps do really well with cleans generally anyway, so it’d be cool to know just how much the Eminence has improved things. Good tips too – and we’d agree 100% re: testing out different speakers! Timely article, having just scored a Grandmeister, and a good buddy has picked up a Carvin V3m, we’re getting together with a few speaker boxes this weekend to do some A/B tests. Greenbacks vs V30s vs … some other old box, will have to open it up to see what they are. But it will be very interesting to see what the differences are. ……. and wondered why it has Eminence Rockdrivers in it rather than Celestion’s? Eminence told me that the Rockdriver is similar to the ‘Wizard’ (I think), and it was specially designed for the Switchblade. Good amp by the way, does all I need and more. Very Happy.